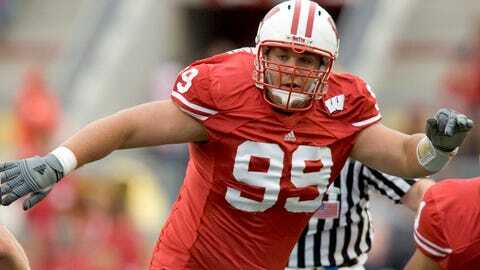 Not making the NFL didn't define former Wisconsin Badgers defensive tackle Justin Ostrowski. When you have a lot of athletic talent the plan seems simple enough. Become a star high school football player, get recruited by and sign with a Power 5 college — such as, say, Wisconsin — develop your skills and then head to the NFL. This is the goal of the majority of college football players, even more so for those who were widely thought-of as recruits (i.e., getting a three-star or better designation). And don’t kid yourself, this applies to the majority of those who have worn the Badgers uniform, too. Some are able to succeed down this road. Look no further than most games on Sundays, with former Wisconsin players littering the NFL, from emerging superstars to solid veterans to those who are just trying to hang onto a roster spot for as long as they can. But what happens when the dream dies? When, for whatever reason, the player doesn’t make the NFL? When there’s no more football, when the competitive drive which took him to an elite athletic level needs to be diverted? What happens when that player’s goal — which they’ve worked on for the majority of their life — is no longer a reality? It isn’t often you can pinpoint the exact moment your life changes. But Justin Ostrowski can. In fact, he flashes back to that moment every summer. Or remembers it any time he tries — key word here is tries — to run. A five-star recruit out of high school, Ostrowski was living his dream, following in the footsteps of Mike Thompson, a defensive tackle from Portage, just like Ostrowski, who played for the Badgers a decade earlier. But in what was supposed to be a non-contact drill in the early part of 2005 fall camp, Ostrowski took a helmet to his right knee. In a play and injury he terms as both a “freak” and “fluke,” his knee swelled up and turned black and blue. Ostrowski’s days of playing football weren’t done yet but this precipitated the conclusion. His leg would have to be immobilized and Ostrowski wouldn’t return to the playing field until October. He’d practice, and the knee would swell up. He’d play, and the knee would swell up. “There were sometimes after a game I couldn’t even bend my leg it got so inflated,” Ostrowski recalls. Yet he’d go back out there day after day, week after week. Ostrowski would finish out the season and even started in the Capital One Bowl. However, when spring ball rolled around, the knee was still hurting. It was decided that Ostrowski should have his knee scoped — they had eschewed surgery previously — and discovered it was in much worse shape than was thought. Ostrowski said he was at about 70-75 percent healthy during fall camp and did what he could. When the season began, Wisconsin limited him to just once out of every three practices. It didn’t help. By the fourth game of the season in 2006, the pain had finally become too much for Ostrowski. His parents tried to get him to think of the future, of having kids and wanting to be able to play with them — hard for any college kid to truly imagine. But Ostrowski knew. His days of playing football were over. Ostrowski made no bones about it. 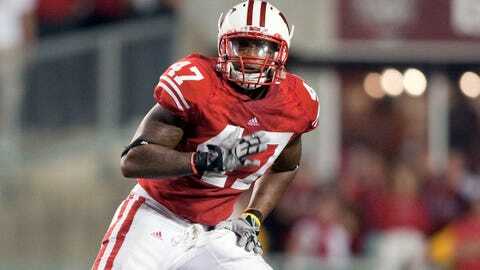 His goal upon arriving at Wisconsin was to play in the NFL. He had played sports since he was 3 years old, athletics consuming his life. A four-sport athlete at Portage who developed into a high school All-American and a football player wanted by major colleges now had to come to grips at the age of 21 that there’d be no more football for him. There’d be no NFL. “That was a tough one to grasp. Football was everything,” Ostrowski says. “I love football. Just the team concept and playing for each other, that was hard to just give up. You know, you can quit basketball and go play pickup basketball games, you can go golfing on the golf course. But once football is over with, it’s over. “There’s not many pickup football games going on,” he adds with a chuckle. In what he admitted was a “very emotionally draining” time it turned out it was football which ended up helping make his life transition. Then-head coach Bret Bielema asked Ostrowski if he’d want to work with John Dettmann, at the time Wisconsin’s Director of Strength and Conditioning, in the weight room. Bielema also let Ostrowski assist with the scout team and even brought him on road trips. When he graduated from Wisconsin in 2008, Ostrowski knew he wanted to get in sales. He also wanted something which would stoke his competitive fire, the same thing which fueled his athletic aspirations. He quickly landed a job with CH Robinson Worldwide and has been there ever since. His days largely consist of him sitting in front of two computer screens and two telephones. While his playing days are over, he works out and has lost weight (which topped over 300 pounds at Wisconsin), and can shoot hoops, throw a football or play with his two sons, aged 4 and 2. That doesn’t mean sports are out of his life, however. 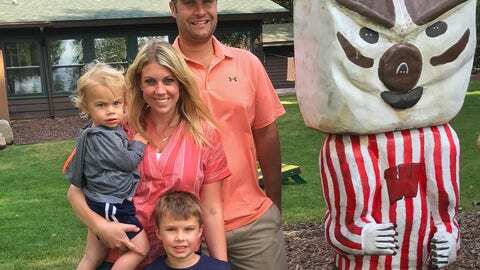 Ostrowski used to help coach Portage’s football team, but gave that up so he could spend more time with his family, especially now that his older son is getting involved in sports. He, has however, kept his job as an assistant basketball coach at Portage, where his father-in-law is the head coach. Part of his duties as a coach is to teach his players about basketball, of course, but also to motivate them in all aspects of life. And Ostrowski has no problem telling his own story to get across his point. “Throughout the course of the last 10 years, I’ve tried to use some of my examples,” Ostrowski explains. “Don’t take anything for granted and just leave everything on the court, or whatever you’re doing in life, just try to maximize your potential and do everything with a purpose. He wasn’t the flashiest linebacker Wisconsin has ever produced, but Jaevery McFadden led the Badgers in tackles in each of his last two years, including his junior year in 2008 when he had played with a club due to a broken hand. But when the NFL draft came and went, McFadden never heard his name called. When players were being scooped up left and right in the league’s undrafted feeding frenzy, again McFadden was left out in the cold. While there were opportunities — he had tryouts with Minnesota and Washington — McFadden never got signed to a roster. He realizes that, unless you are someone like J.J. Watt, you need a little something else. When he was in Washington’s camp, McFadden was one of 11 linebackers, making it hard to stand out. For example, one day with the Redskins the team had players unexpectedly run the 40-yard dash. Diminutive wide receiver Brandon Banks, who was all of 5-foot-7, 150 pounds, blazed his way through it. McFadden saw all the coaches gather and look at their stopwatches — he knew at that point Banks made the team (Banks would go on to play three years with Washington as its kick returner and has played in the CFL since 2013). “And that’s why I say you need a little luck … (but) wherever the chips fell, I was fine with it,” McFadden says. While McFadden never made the NFL, plenty of his friends and teammates did. He still remains close to Jonathan Casillas and Lance Kendricks, both of whom are still playing. But without football, what was he to do? McFadden acknowledges that he really didn’t know. “Once I realized the NFL isn’t going to be it, I took like a year off, did a lot of traveling, clear my mind,” he says. “Just thought about what I wanted to do for the rest of my life because technically my whole life had been about school and football, or sports. So I was like 23, 24, 25 years old and I was like, OK, so what am I going to do next? But besides football and the NFL, McFadden always had his eye on another prize: getting his diploma. McFadden says that Wisconsin prepared him for life — and not just a football life. His academic advisor, who McFadden still is in contact with, kept on him to not just do his work but go beyond. Get his papers turned in on time, study, exceed expectations. McFadden did get his degree and says even if he played in the NFL, his commencement at Wisconsin still would be the highlight of his life because his grandmother, now deceased, flew on a plane for the first time just to be in Madison to watch her grandson get his diploma. Getting that piece of paper did a lot more for McFadden, which he soon found out once he realized his football days were over and took a look around at how some others, in a similar situation, were faring. “I have a lot of friends here where they do the whole football thing and it don’t work out, then they get in the real world and they be going crazy, like they don’t know what to do,” McFadden says. “They don’t know how to create a resume, or ask for a job or go for a job. They don’t have other skills. Entrepreneurship is still on his mind and he recently graduated from New Leaders Council, but in the meantime McFadden found a job that doesn’t feel like, well, work. For the past year-and-a-half, McFadden, who is back living in the West Palm Beach area where he grew up, has been working for the Parks and Rec department (which he says, only half-kiddingly, is kind of like the TV show). McFadden mainly works with youths, starting up programs, working in camps and helping out at the Youth Empowerment Center, where he talks with teenage kids about a variety of subjects — anything from girls to how to get into college to what courses they should take. There was even one kid, a wide receiver in high school, who was hoping to get a scholarship to play in college, but tore his ACL. McFadden had former Badgers teammate Aaron Henry, who at the time was coaching for Rutgers, come and talk with the prospective player. McFadden also was able to dispense his own knowledge, as well as other teenagers, much like Ostrowski drawing from his own experiences. McFadden is a living embodiment of what he preaches. He has no regrets on how things have turned out for him. He sees how his friends have paid the price for playing football. Casillas has had to overcome injuries to his hand, back and neck. DeAndre Levy, a former teammate and friend, barely played the last two seasons due to a variety of injuries and has had knee surgery. McFadden carries only a scar from the broken hand he suffered in college and otherwise feels 100 percent healthy. “My friends in the NFL, they’re banged up. They’re really banged up. Like they can’t turn their neck, they have to turn their whole body. There’s a price,” McFadden says. “That’s why I tell people if I have kids, I’ll be able to bend down and play with them when I’m 40. … (Levy) is set up for life, but there’s a toll you put on your body. Dre played physical, like knock people out — in college. I remember in college he and (fullback) Chris Pressley used to go at it in the inside drill like …. Dre just knocked people out. But it takes a toll. Sam Arneson could have played in the NFL. Heck, he still could be playing. 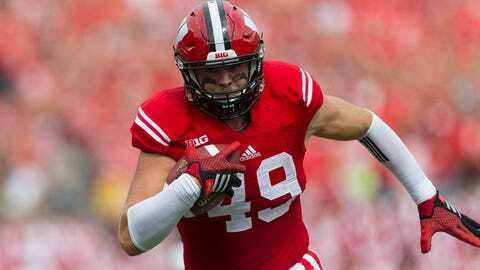 After his senior season at Wisconsin, the tight end was invited to the NFL combine and right before the draft several teams called him to check in and let him know they might draft him. One problem: Arneson had quit football right after the Badgers’ Outback Bowl victory months earlier. “I kind of laughed … these teams aren’t doing the most research on me,” Arneson recalls thinking. It’s not that Arneson didn’t want to play in the NFL. Quite the contrary. Like most other players who attend Wisconsin, that was his light at the end of the collegiate tunnel. Entering his senior year, Arneson knew he was garnering attention and a good season could propel him to the next level. While he was mainly a blocking tight end as a sophomore and junior, he was productive when the ball came his way, accumulating four touchdowns among his 10 receptions those two years. In 2014, his senior season, he was to be more involved in the offense, only increasing his stock. Arneson did have a solid year, catching 29 passes for 387 yards with four touchdowns. But to just get on the field he had to pay a price. Even before coming to Wisconsin, Arneson had two knee surgeries while in high school, his first as a freshman. Arneson notes he “only” had one surgery while at Wisconsin and missed just one game in his time with the Badgers. Because he played so much on Saturdays — Arneson said he was “playing pretty much every offensive snap” — he’d practice just once a week to help manage the swelling. Coming into the year, Arneson told himself he’d decide whether to pursue the NFL by the time Wisconsin played in a bowl game. As it turned out, it wasn’t the knee which was the deciding factor. In the Big Ten championship game against Ohio State, Arneson suffered a concussion and wasn’t allowed to return to the game. That injury served as a wakeup call as to what he might have been putting himself through. Arneson had a few weeks between that game and the bowl to decide his future. His mind never wavered. The game against Auburn would be his final football game. Playing with his parents in the crowd as always, Arneson would finish his final collegiate game with just two catches in Wisconsin’s overtime victory over the Tigers, although one was a key reception on fourth down which led to the Badgers tying the score in the fourth quarter. Now Arneson had to figure out what to do with his life. Education was never an issue. He came to Wisconsin wanting to get his degree — which he did, in kinesiology. After being a 4.0 student in high school he was selected as an academic all-Big Ten three times. But his days and nights had been consumed with football. The plan had been football. Arneson still wasn’t sure what path to take, however. A talk with a former coach helped. Paul Chryst had been Arneson’s offensive coordinator when he was a freshman. Arneson regularly would head up to Chryst’s office and chat with him. With Arneson done with football and headed to graduation, Chryst, who left for Pittsburgh in 2012, had returned, hired as Wisconsin’s head coach weeks after the Outback Bowl. Arneson, now “just a student finishing up my degree,” found himself paying visits again to his former coach as he sought guidance. After college, Arneson ran a football camp that first summer but then there was a fishing trip to Canada. A stop in Kansas City to visit his uncle, who is a coach with the Royals. Hitting Las Vegas for the first time with his girlfriend. Figuring he’s young and able to move, he followed his girlfriend last year to Chicago, where she got a job as a dental assistant. Sports is still a part of his life, whether it’s biking, golfing, sand volleyball or getting together with some former teammates for a mean game of Frisbee or darts. Arneson has lost about 40 pounds from his playing days, when he weighed 255, which helps his knee. But there are still issues. He bikes now because running can give him problems. “It’s not a debilitating thing, but at times you wish it was in a little better shape than it is,” he says. Still, Arneson knows his troubles with his knee will only get worse. His father, Dave, also played at Wisconsin. Dave Arneson just turned 55 and already has two fake knees, one of which he got 10 years ago. And Sam says his father’s injuries weren’t nearly as bad as his own. Arneson isn’t looking that far ahead, though. He doesn’t look back, either. Well, maybe a little bit. Arneson has no regrets about quitting football, but still only a couple of years after having left Wisconsin, the idea of playing in the NFL is still tucked away somewhere in the back of his brain. But instead of playing in large stadiums in front of big crowds this fall, Arneson will continue to try and find a job he can call his own. But don’t take this the wrong way. Arneson has zero regrets about his decisions, whether it was to quit football or even play on a bad knee for seven years. Seeing recent reports on the latest CTE study or players retiring early, like former Penn State and Baltimore Ravens offensive lineman John Urschel, have only cemented the fact he made the right call — and at the right time. Working in Chicago was just a blip in the road. The plan has been for he and his girlfriend to head back to Madison once her job ended at the end of August. He’ll look for a more permanent job — he has an interest in perhaps getting into the medical sales profession — something that can be competitive and also lean towards his studies of health and science. He’ll also of course follow the 2017 Badgers football team. He played with some of the current team members and claims tight end Troy Fumaglli among his best friends. But for now, he’s taking it as it comes. Something will happen along sooner or later. After all, goals can change. There is life after football.